From its consistent contemporary design inside and out, to the location which presents phenomenal 180 degree views over the township, lake and mountain ranges, its top of the line equipment to every facility you would need for a crème de la crème vacation in Queenstown. Stelvio boasts four bedrooms plus a comfortable nanny’s quarters – all taking advantage of the world renowned views. The master bedroom is private and heavenly with a walk in wardrobe and shower room, separate glass room for the toilet and bath to create serene moment amongst the breath-taking sights, a large private balcony and yoga platform. The main living area has a fabulous open flow between the chef’s kitchen, the two seating areas and dining space – possessing the ultimate in luxury furnishings and art. 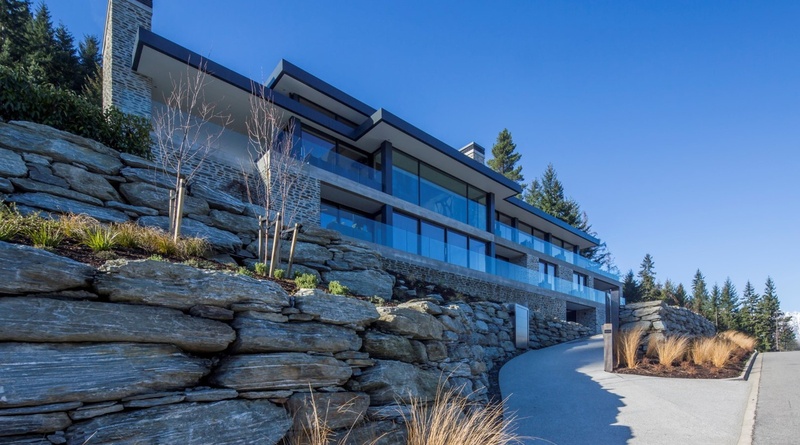 This then leads onto an alfresco area, which is an entertainers dream with a large sunken fire pit, spa and fully equipped outdoor kitchen – all with sensational views to assist with the enjoyment of your awarding Central Otago wine. Facilities also include a cinema room, bar, gym, games room, office, drying room, elevator and 6 car garage.